Blame it on George Washington: a war that spilled from the Appalachian backwoods onto battlefields around the world. The French and Indian War, known in Europe as the Seven Years War even though it lasted for nine, was one of the bloodiest episodes in the centuries-long war between England and France. 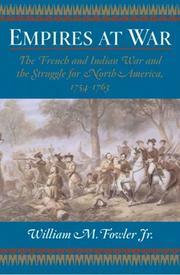 At stake, writes Massachusetts Historical Society director Fowler (Under Two Flags, 1990, etc. ), was which power would have dominion over the world beyond Europe. Indeed, the war was played out eventually in Europe, Asia, and Africa as well as in the Caribbean and North America. That outcome may have been in the cards anyway, but it was hastened along when George Washington, then a 22-year-old major in the Virginia militia, unwittingly presided over a massacre of French prisoners who’d been seized by England’s Indian allies. Or so he later explained, though Fowler sensibly adds that “It remains an open question to why Washington felt compelled to attack a sleeping camp without warning at a time when the two nations were at peace.” Soon British and French fleets were sailing, and the conflict shifted from the Appalachians to eastern Canada. Fowler’s narrative moves forward partly through thoughtful character sketches of some of the principal participants, from the justly ignored (the larcenous governor Francois Bigot, “a particularly clever and imaginative bookkeeper”) to the honored-for-all-time (the Marquis de Montcalm, buried with full military honors only in 2001, and his fellow victim at the siege of Quebec, James Wolfe). Well crafted and well paced, the narrative reveals some of the political complexities of the war, among them the controversy surrounding Wolfe’s appointment by the untested William Pitt and the crown’s enforcement of peace on the frontier, the latter being one of the things that would soon turn the American colonies against the mother country. An accessible treatment of a war often viewed through the lens of the revolution that followed, though much more complex than only that.